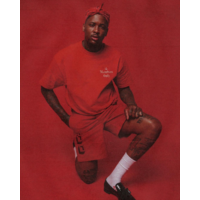 Keenan Jackson (born March 9, 1990), most known by his stage name YG (short from Young Gangsta), is an African-American Compton-based rapper and songwriter of the West Coast scenery. In his earlier years he was gang affiliated with the Westside Tree Top Piru gang. He was signed by Def Jam in 2009 and released his first single titled "Toot It and Boot It", which peaked at #67 on the Billboard Hot 100, in 2010. He is most associated with the Jerkin' movement based in California alongside other artists including singer and occasional rapper Ty$, who sings the hook on "Toot It and Boot It". He is affiliated with the group Pu$haz Ink. After releasing several songs that garnered him a large following on the internet, such as "She A Model" and "Aim Me" he signed to Def Jam. He is working on his debut album set to be released in 2012. He was also featured in XXL Freshmen Magazine. A song of his entitled "Snitches Ain't", featuring Tyga, Snoop Dogg and Nipsey Hussle, entered the Hot 100 at #100 and at #11 on the Heatseekers Songs chart.